On July 14th, a momentous event occurred for Poland – Jerzy Buzek was elected President of the European Parliament. Buzek is not only the first Pole to be elected to the position, but is also the first president from a Central and Eastern European EU member state. Buzek’s victory is especially symbolic considering 2009 is the 20th anniversary of the fall of communism in Europe. But of course, his election is much more than a historically symbolic gesture. Who is Jerzy Buzek exactly, and how did he make his way to the top of the world’s second largest parliament? More importantly perhaps, what will his election mean for Poland and the future of the EU? Jerzy Buzek was born on 3 July 1940 in what is now Smilovice in the Czech Republic (Poland’s boundaries were changed after WWII). He was born into a Protestant family and remains a Protestant to this day, which is significant considering the Catholic Church’s dominant role in Polish society and politics. After WWII his family relocated to Chorzów and Buzek’s father became an engineer. When Buzek himself came of age he followed in his father’s footsteps and chose to study engineering. In 1963 he graduated from the Mechanics and Energy Faculty of the Silesian University of Technology in Gliwice, specializing in chemical engineering. He then became a scientist in the Chemical Engineering Institute in Gliwice. Like many of his contemporaries, his career as a scientist was put on hold in the 1980s by the rise of the Solidarity movement. Beginning in the early 80s, Buzek was an active organizer of the Solidarity trade union’s regional and national underground authorities. His role in the movement gradually became more involved as events escalated and political tensions grew throughout the decade. He fought hard to instigate political and economic reforms in Poland and became known for his pragmatic leadership. Once Solidarity was allowed back in the political process, he chaired four national general meetings (1st, 4th, 5th and 6th). After 1989, Buzek mostly stayed on the sidelines of politics, although he remained a senior member of the Solidarity Electoral Action (Akcja Wyborcza Solidarność, AWS) and in 1997 was elected to the Polish Sejm. Due in large part to his leadership in AWS, Buzek was quickly appointed prime minister of the right-centrist AWS–UW coalition government. As prime minister in the years 1997-2001, Buzek decisively steered Poland westward and successfully guided Poland into NATO structures in 1999. He also initiated accession negotiations with the European Union in 1997, which would prove to be a monumental step for Poland as well as for his career. Domestically, he instituted significant reforms in the pension, education and health care systems as well as devising an entire new local government and administrative division of Poland. Despite mostly favourable public opinion, Buzek’s career as a Polish politician ended abruptly when his party AWS was defeated in the Polish parliamentary election in 2001. His westward leaning politics as prime minister proved to be even more significant once Poland joined the EU. On 13 June 2004 Buzek was elected a Member of the European Parliament (MEP). Since then he has called upon his experience as a politician, scientist and engineer to enact EU policy. He was a member of the Committee on Industry, Research and Energy, and an alternate member of the Committee on the Environment, Public Health and Food Safety. He quickly earned a reputation in Brussels for his diligence, passion for public policy and his ability to find a compromise. 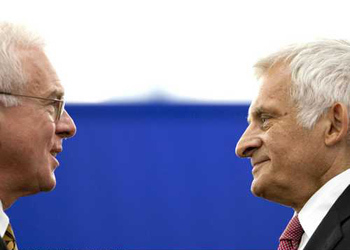 On 7 June 2009, Buzek was re-elected to the European Parliament by a record number of votes in Poland. His broad support in Poland is one of the main reasons that propelled him to the Parliament presidency. So what will Buzek’s presidency look like and what policies will he support? In large part the EP president is more of a bureaucratic position and doesn’t wield much actual power. However, if the Lisbon Treaty were to be adopted, the European Parliament and president would play a much greater role in EU policy-making. Naturally, at the top of Buzek’s agenda is the desire for the Lisbon Treaty to be adopted as soon as possible. In step with the times, Buzek has also pledged to take swift action to shore up the suffering European economy that has been so hard hit in the global recession. In more long-term policy, Buzek will focus a lot of time and attention on energy supply and energy security, which is one of the most important and controversial issues facing the EU. Buzek’s Polish nationality may prove more than symbolic when it comes to his stance on energy policy as well as the future expansion of the EU. His term is two and a half years (five years split between the two ruling parties in the EP) and there is no question that he faces a lot of challenges. But regardless of what happens, his election is a great accomplishment for himself and for Poland. Sto lat, Panie Jerzy!